Tom Hanks succumbs to the horrors of tabletop RPGs. Or does he? Trigger warning before we kick off here: suicide and suicidal ideation are going to come up a lot in this review. The 1979 disappearance of James Dallas Egbert III, a troubled student at Michigan State University, should in principle have been one of many missing persons case - sad, concerning, but not the cause of widespread scandal. It became the sort of story tabloids dream about when William Dear, a private detective hired by the Egbert family to track down Dallas, theorised that Dallas may have disappeared into the steam tunnels beneath the university under the influence of too many games of Dungeons & Dragons. In fact, Dear soon abandoned this theory, but he found himself unable to contradict or retract his previous statements - for when Dallas was found, it turned out that he had run away in part because he was in the closet and was not at all coping with it well. Desperately afraid of his family’s reaction, he made Dear promise to conceal the real story of his disappearance, and therefore Dear kept his silence until 1984 - 4 years after Dallas succeeded at the latest of a string of suicide attempts, and well past the point when the anti-D&D witch hunt the case had kicked off had become impossible to contain. In the gap between the news story first breaking and Dear’s The Dungeon Master finally setting the record straight, Rona Jaffe wrote Mazes & Monsters, a sensationalist novel based around a highly fictionalised version of the Egbert case - or rather, the Dungeons & Dragons-based urban legends surrounding the case. And in 1982, a fresh-faced young Tom Hanks took the lead role in a TV movie adaptation of Jaffe’s novel. The end result is a movie widely reviled amongst gamers as a component of a bizarre smear campaign against their hobby. However, when I sat down to watch the movie (obtained on a shockingly cheap and probably quasi-official DVD) with Dan and Kyra, we noticed a curious thing: although if you really wanted to you could see it as a harrowing expose of the dangers of RPGs, you can only read it that way if you were already hostile to the hobby and inclined to believe that the game was inherently dangerous. Shorn from the original context of the Satanic Panic, the movie isn’t actually about how evil Dungeons & Dragons is at all. Actually, it’s about ethics in Dungeon Mastering. The movie revolves around three college friends - JayJay (Chris Makepeace), Kate (Wendy Crewson) and Daniel (David Wallace). It’s the start of term and they couldn’t be happier to be back at college - not least because it means they can get their ongoing game of the hit tabletop RPG Mazes & Monsters going again. As luck would have it, they soon make the acquaintance of Robbie Wheeling (Hanks), a new student who has just transferred to their college and a Mazes & Monsters veteran. Although he is a little unsure of how much he wants to get involved in M&M again - apparently part of the reason he was kicked out of his previous college was because he got a little too involved in it - Robbie is won over by the others and starts playing with them. As the four gamers work on balancing their studies, their gaming, and coping with the various troubles in their lives, it’s clear that some are having a harder time of it than others. Kate is dissatisfied with her love life and wonders whether she’s doomed to keep making bad choices of partner, Daniel finds the macho expectations of college sporting life don’t really gel with him, and JayJay is convinced his ever-distracted mother doesn’t understand him and finds himself prone to fits of loneliness and occasional suicidal ideation. But all this pales in comparison to what's going on with Robbie. Aside from having to deal with an overbearing father and an alcoholic mother, Robbie is haunted by the memory of his elder brother Hall. Hall ran away from home years ago with a vague plan to make it big in New York City, and Robbie was the last person Hall spoke to or confided in before his disappearance. Robbie confides that he still dreams about Hall, so it’s evident that on some level he hasn’t processed what happened. Matters come to a head when JayJay decides to take the game to the next level and get into some LARPing, having realised that some local caverns would be ideal for that purpose. Mid-LARP, Robbie suffers what can only be described as a psychotic break, and henceforth becomes convinced that he is his M&M character - the cleric Pardieu - and that Pardieu has received a sacred quest from an entity known as the Great Hall. It’s no surprise to the audience when the Great Hall happens to be an allegory for the missing Hall - or that the quest involves Pardieu/Robbie finding Hall by heading to New York City, where after shambling around at random for a while he realises that to get to the Hall he must climb to the top of one of the World Trade Center towers and fling himself off. Can the rest of the party catch up to him in time to suggest that taking a long rest might be a better idea? Now, in principle you can see how that story can be spun in an anti-Dungeons & Dragons direction. However, it really doesn’t pan out that way. Oh, sure, when the cops find out there was a Mazes & Monsters angle to the disappearance they react like they’d been told that Robbie and his friends had been dabbling in Satanism or formed a Communist cell, but there’s a long and honourable tradition in movies of such authority figures being complete wastes of space whose unerring ability to get the wrong end of the stick forces random civilians to solve the mystery instead, and this movie is no exception. 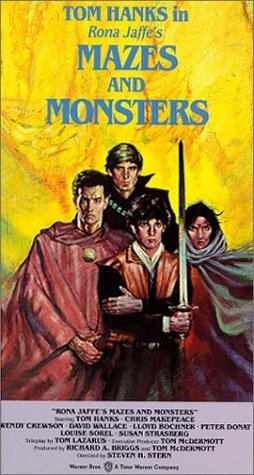 Furthermore, any objective look at the role Mazes & Monsters plays in the story would lead to the conclusion that actually, the game is more or less consistently depicted as having a positive influence, and the only way you can come away from this film with a negative impression of tabletop RPGs is if you’d already decided you hated them and you didn’t think through what you were seeing onscreen. Of four gamers profiled in the film, three of them graduate from university with the various emotional problems and difficulties they’d been depicted as struggling with earlier on in the film overcome as they have grown as individuals, worked through their issues constructively, and gained confidence and the ability to make their own way in the world. They’re happy, successful young people, and at least one of them has made a very successful career in the games industry. Now, admittedly Robbie’s outcome is nowhere near as happy as the other three’s, but it is blindingly, shockingly obvious that there’s factors at play with Robbie that simply don’t apply in the cases of the other students. Of the other three, JayJay is the one who clearly has the most urgent mental health issues, since he does contemplate suicide at a couple of points during the movie, but this is fairly obviously the result of him going through a bit of a dark and lonely patch in his life and, crucially, he never actually follows through with the suicidal ideation - in fact, when he goes to the caverns with the intent of disappearing in there never to be found again, he is instead inspired to use them as the setting for the group’s LARPing, so in fact his gaming hobby gives him a creative outlet which allows him to feel that he is a worthwhile person who deserves to be alive, and by the end of the film he seems to be out of his dark patch. By comparison, Robbie’s mental health is in a condition many orders of magnitudes worse; delusions, loss of identity, megalomaniac visions of possessing magical powers, behaviour causing him to be a danger to himself and others, and a disconnect from reality so profound that, far from developing this suicidal ideation, he doesn’t even believe that jumping off the World Trade Center qualifies as suicide - that’s obviously much more extreme than anything any of the other characters feel or experience. But as well as the quantitative difference in their emotional problems, there’s also a very important qualitative difference in the way their play affects the four gamers. Specifically, whilst JayJay, Kate and Daniel form closer social bonds to each other as a result of regularly playing the game with each other, Robbie responds by becoming more isolated from the others and from the rest of society, sealing himself away inside the identity of Pardieu. This is incredibly significant: whilst all the participants in the game find their characters and the gameworld engaging, for Robbie the game experience is literally all about his character, and he consequently ends up valuing the other players’ characters for the role they are able to play in enabling his fantasies whilst at the same time becoming increasingly disinterested in the players themselves (because their real identities are irritating reminders of a world he is actively trying to disconnect from). In fact, the pursuit of his Pardieu delusion leads not to excessive playing of Mazes & Monsters on Robbie’s part, but in fact on him locking himself away and shutting himself off from the other players so as to better pursue the Great Hall. In other words, not only does Robbie react to Mazes & Monsters in a way which is clearly highly atypical and illustrates a basic inability to socialise and form rewarding relationships with people, but on top of that one of the major warning signs that Robbie’s getting to a crisis point is that he stops playing the game! In fact, it’s clear from the film that Mazes & Monsters is more or less the only social outlet Robbie successfully develops in college, and equally clear that his fixation on his brother has been a major impediment to him for quite some time. More or less the only respect in which Mazes & Monsters actually undermines Robbie’s mental health is in providing a framework for his delusions about the Great Hall, but there is no suggestion that avoiding Mazes & Monsters would somehow make Hall’s shadow weigh less strongly on Robbie and every reason to believe that he could have had a psychotic break based around his fixation on Hall in more or less any other circumstance. If it isn’t enough that Mazes & Monsters ends up being a net positive in the lives of three of the gamers and clearly isn’t the real source of harm when it comes to Robbie’s issues, let’s address how the game ultimately saves Robbie’s life. The film makes it very obvious that the police are barking up the wrong tree, and it’s only the inspired sleuthing of JayJay, Kate and Daniel that results in them tracking down Robbie before he kills himself. Not only does this require them to use all the problem-solving and lateral thinking skills they’d honed during gameplay, as well as using their understanding of the fantasy genre to penetrate Robbie’s somewhat oblique notes and work out what he’s driving at, but on top of that it requires them to use their knowledge of Robbie’s personality, past and motivations. This is knowledge which they only have in the first place because of how close he got to them whilst playing Mazes & Monsters, before his fixation on Hall got the better of him. Oh, and of course there’s the small issue that it’s precisely because of Mazes & Monsters that Robbie has a trio of good buddies determined to see him home safely! With acting and a budget more or less typical for a cheap TV movie intended to riff on a topical story, Mazes & Monsters isn’t exactly going to give Citizen Kane a run for its money and was never really in a position to. Still, it’s rather clever for the way it - deliberately or otherwise - subverts an intended “Imagination and creativity are bad/don’t trust any game with funny-shaped dice” message into “be a good gamer-buddy and check in on people if they break off contact for no clear reason and start acting strangely”, and there’s some amusement value to be had in the sheer 80s-ness of it all. "Actually, it’s about ethics in Dungeon Mastering." And thus we learn that Mazes & Monsters is not, in fact, a far-out game. That's one of the scenes that really dates it - I mean, back in the day you can sort of see how games featuring the sort of subject matter the cops describe might seem alarming to an audience for whom the most violent game out there was Cluedo (in which all the violence takes place before play), but these days people aren't really surprised by any of that. Most gamers I know actually love this movie in an MST3K schlock-value way. It is just SO over the top, and young Tom Hanks chews the scenery adorably. But it's amazing how, even at the time, even if they wanted to blame D&D for Robbie's breakdown, nobody seemed to notice that the other three gamer characters came through the movie just fine! I used to have a copy of this on VHS, but I donated it to some sale or other when I was getting rid of my tapes. A few weeks ago, I found a DVD copy in a used media store and snapped it up eagerly. Can't wait to make my gaming group watch it (most of them have never seen it) so we can all have a good laugh. My DVD copy is incredibly sparse - it's one of those DVDs which advertises scene selection as a special feature, rather than the bare minimum you expect out of a DVD. If you can track down a copy (you can probably find it fairly cheaply), I also recommend Skullduggery for this sort of action. Broadly similar concept, includes Wendy Crewson reprising her Token Girl In the Gaming Group role, plus... well, I'll probably review it on here at some point, but I want to give more people the chance to come to it unspoiled. All I'll say is that it somehow merges Mazes & Monsters with utterly incompetent slasher movies and then sprinkles on a light dusting of Eyes Wide Shut. Sweet Gary Gygax, Skullduggery looks horrifically, deliciously awful based on the clips I could find. I looked it up based on your tip. Please, please review it here! One of the funniest parts was seeing the game scenes, which looked fairly normal, and remembering, "Oh yeah, I'm supposed to be creeped out by these bits, because they're clearly Dabbling In Dark Powers." And why are they making new characters at every session? Even Mazes and Monsters didn't make that mistake. Unless they just have a real killer DM who ends every session with a TPK, in which case that's a very masochistic group... I'm thinking about this too much, aren't I?